SKU: 1005. Category: Urine Drug Testing. This product is designed to cleanse your body for an alcohol test. If you get tested with The EtG (Ethyl Glucuronide) test, Look no more, stop drinking alcohol at least 24 hours prior to you test and use our Supreme klean Detox Tea and you will Pass.. Whether you abuse drugs regularly or very rarely, passing a urine drug test is something that is vital for any person who has used drugs. 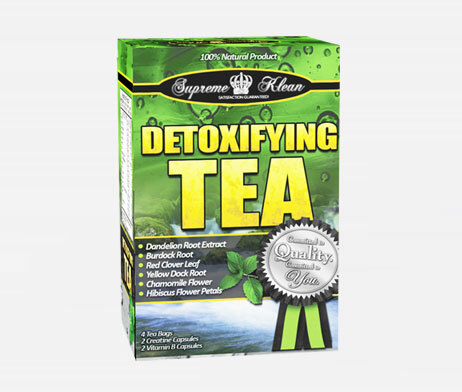 Supreme Klean Power Flush Detox Tea is one of the best detoxifying Teas that can cleanse your entire body. This product has been produced by a set of experts who are highly experienced and have done a thorough research in this field. It has 99% sucess rate. The Supreme klean Detox Tea is extracted from the herbs that are proved to be the most useful ones to detoxify your body. The herbs we use are of superior quality and are certified Kosher and Parvea. We are sure you wouldn’t find a better Detox tea product in the market. Supreme klean Detox Tea works best on medium to low levels of THC and high levels of several street drugs. Some of the drugs on which the Detox Tea works best are as follows. Do not expose your body to any kind of toxins or medications 2-3 days before the use of Power Flush Detox Tea. Additionally, drinking lots of water before using our product can help you reduce the toxin levels in your body. The Power Flush Detox Tea should be prepared when you have nothing in your stomach. Boil 16 cups of water and take off the heat. Now place all the 4 tea bags in the boiled water and leave them for ten to fifteen minutes. Get rid of the tea bags from the water. The intake can either be hot or cold. You can always add sugar to improve the taste of the tea. Drink all 16 cups of tea within a span of three hours. When you drink the last 4 cups of tea, make sure you swallow a couple of Vitamin B-Complex Capsules and a couple of Creatine Capsules. Urinate at least 2-3 times. Remains effective for about five hours. The product works best even for high levels of all water based drugs. Please note that most of the drugs are available in several forms and that the Power Flush Detox Tea works on all high level and low levels of all water soluble drugs. It can work on low levels of THC (marijuana) but not on the high levels. It is therefore not recommended for frequent users of marijuana. Frequent drug users are advised to use Supreme Klean detox drink instead of this tea. Power Flush Detox Tea does not work for oil based drug ‘Xanax’ or THC. To cleanse your body after consuming Xanax or THC, you can use our product, Supreme Klean Detox Tea first then use or Ultra Klean detox drink which works best even with oil based drug. Power Flush Detox Tea is best recommended for cleansing high levels of cocaine. On the other hand, if you have high levels of cocaine or prescription medication, we recommend you to use Supreme Klean Detox Tea. How to Get the Best out of Supreme Klean Detox Tea? For achieving optimal results, remember that the product works best on all high level of all water soluble drugs but NOT for high levels of THC. For high levels of THC, please use Supreme Klean detox drink. Also, try to maintain a healthy diet and physical exercise regime to make sure your body is completely free from all kinds of toxins. If you are not satisfied with the results of our product or if our product has failed to work, we assure you to pay back up to 500% of the price of the product.